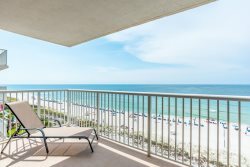 Indigo is one of the most eloquently appointed condominiums on Perdido Key. Vacation in this luxury beach home located in an exquisite beach front setting. Indigo covers 7 tropically landscaped acres on the snowy white beaches and gorgeous blue waters of the Gulf of Mexico and boasts every possible amenity. The spacious 1768 SF floor plan has a large gulf front balcony with a beautiful view of the beach and pool area and is accessible from the Living and Master Bedroom. The two Guest Bedrooms share a terrace which overlooks Intracoastal waterway - great for relaxing and privacy. The Master Suite has a walk-in closet and expansive bath area featuring a walk-in shower, double vanities and Jacuzzi soaking tub. The large, fully-equipped kitchen and bar area with stools open to a beautiful dining room. Other features include granite countertops, travertine and wood plank flooring, contemporary décor and private elevator entry directly to your unit. Electronics include 42" Flat Screen HDTV, DVD, VCR, Stereo in Living Room. Flat Screen TV in Master Bedroom, Flat Screen TV/DVD in both Guest Bedrooms. Wonderful experience from the start to the finish of our vacation! Loved our condo! Will definitely stay again! Called about minor issue with toilet running in master bathroom and maintenance was there to fix issue the next morning. Excellent response time. The original condo we booked was damaged and the team upgraded us to a beautiful condo at another property. We loved the property. Wish we could have stayed longer. The kitchen was well equipped and the decor was lovely. The staff at Perdido Key Realty are very nice, helpful, and accommodating. They made our vacation experience easy and seamless from the time we booked until the time we checked out. We are already in the works of booking with them again! Our stay in Indigo East was perfect and could not have been better. The property is so well kept, and you can tell the staff works hard to keep the property in first rate condition. The pool was AMAZING! The beaches were clean and beautiful. The theater room on the property was so cool! We made so many fantastic memories while staying there that we can't wait for next summer to get here! Everybody I spoke with was very receptive and helpful with my questions. We loved this property. We would definitely rent this unit again. I was very impressed with the property. We were very excited to see the Keurig and bought coffee specifically for that type maker. We had a wonderful week! Indigo East 905 was beautiful and had all household items necessary for our stay. Indigo is a beautiful site, and we enjoyed staying there. Perdido Realty made check in easy and our departure early Saturday Morning went well. We had checked other rental sites and Perdido Realty offered the best rates at the best sites. We will check with Perdido Realty in future for vacation plans.